The DRD Tactical Kivaari is a fully capable semi-auto .388 Lapua Magnum that also is a takedown model. The Kivaari can be broken down quickly and fit into its custom carry case. 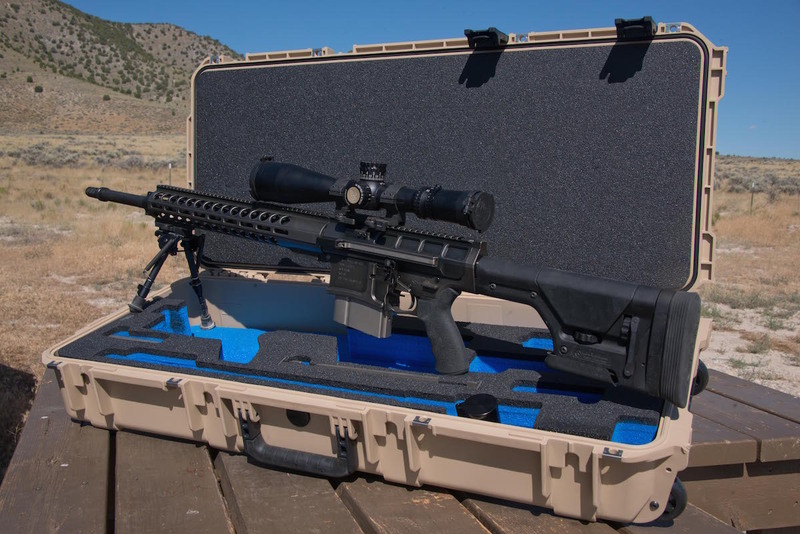 If you are looking for long-range accuracy in a hard-hitting round with manageable recoil, the .338 Lapua Magnum is probably on your short list. 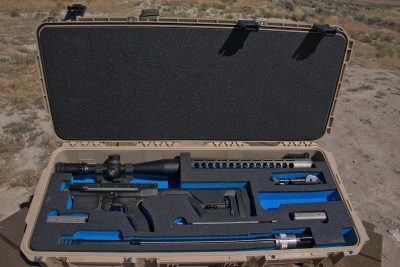 In and out of favor over my career, it is still the go-to round for many agencies, militaries and contractors seeking energy on target without going to a full .50 BMG-based firearm. The .338 is not an anti-material round like the .50 BMG, but it runs circles around the .30 calibers. Europe has all but abandoned the 7.62x51mm for their soft-target sniper rifles. Delivering usable energy to 1,500 yards (and beyond), the .338 Lapua remains manageable yet extremely powerful. Unlike .50 BMG-based rifles, the Lapua is only slightly larger (and heavier) than long action bolt rifles chambered in 300 Win. Mag. or similar. Accuracy is excellent, and given the right ammunition it can be very impressive. In most cases the typical military progression of once a new caliber has proven itself in a bolt gun is to ask for a semi-automatic version. Real world applications are generally less about shooting tiny groups and more about getting hits on threats rapidly while under duress. 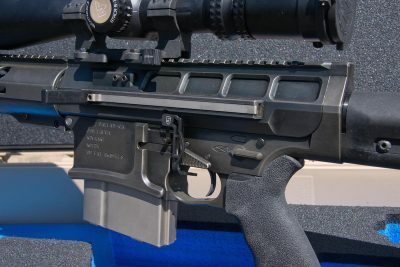 Accuracy remains critical, but a rifle that can deliver rapid fire while maintaining sub moa performance is preferred by many currently performing the task. 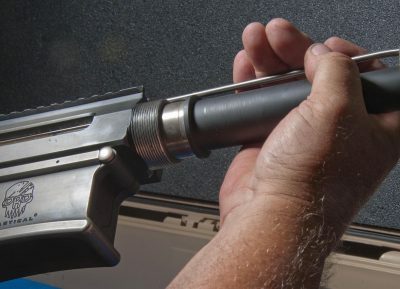 The result in the past has been precision accurate semi-autos in both 5.56mm and 7.62x51mm; pushing for a similar platform in .338 LM was only a matter of time. Once assembled, the Kivaari is ready to take on targets out to extreme distances. These have been around for a few years, but early models from manufacturers could be a bit crude and unreliable. It’s not as simple as building a 7.62x51mm AR. Initial testing was spotty, with reliability being an issue. That is changing rather rapidly as many Special Mission Units (SMU) ask for ones that work and builders and manufacturers continue to answer the call. Over the last few years I have tested most, all if you exclude those that never seem to materialize in the real world. One of the latest, and an excellent example, is the DRD Tactical Kivaari .338. And, this one has a very unique characteristic: It is a takedown model. The rugged receiver of the .338 Kivaari is sized to accept the large, proprietary magazines. 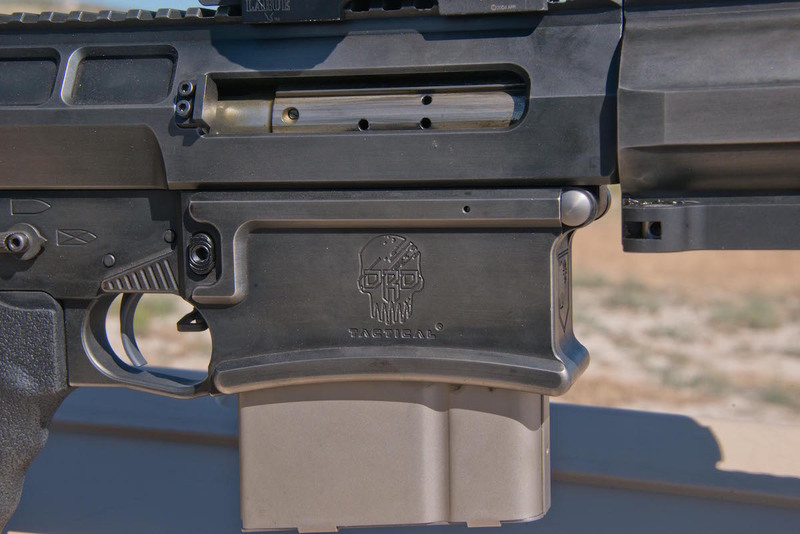 DRD Tactical starts with custom-designed, CNC-machined billet receivers. 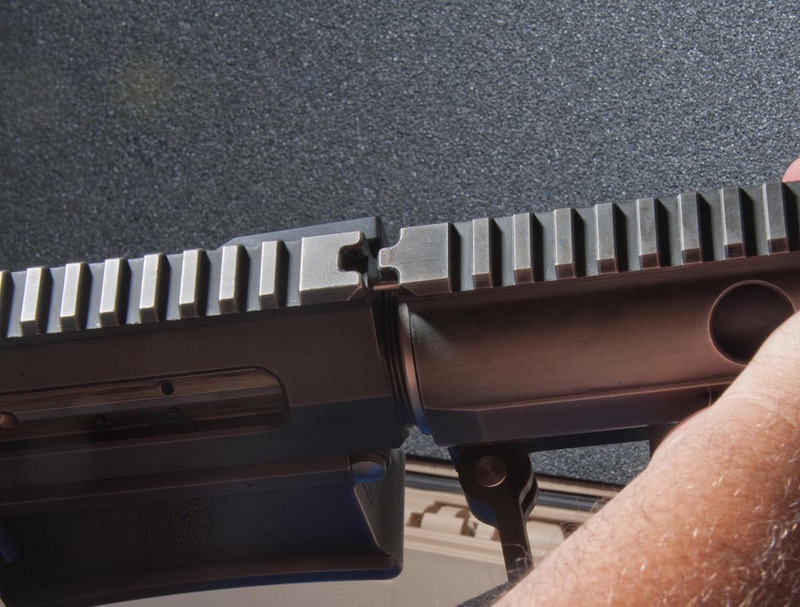 Upper receivers are designed to use a proprietary barrel attachment method. 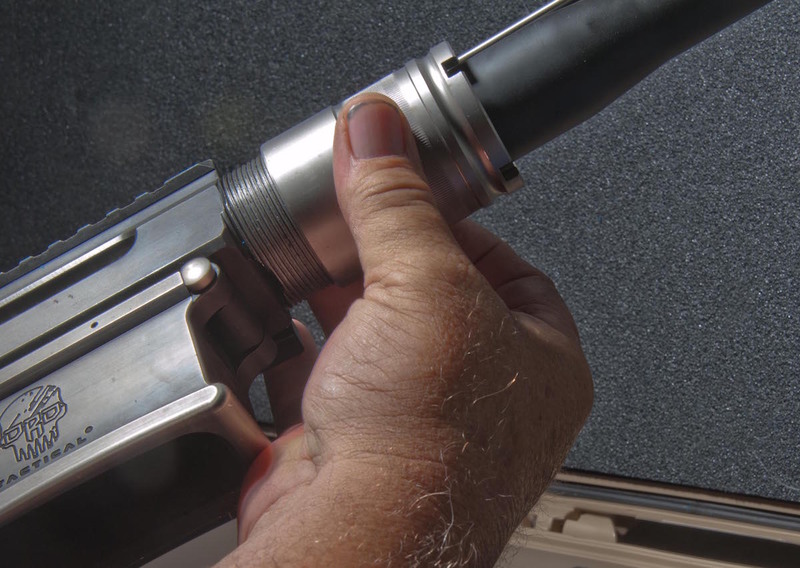 DRD’s patented QD barrel is easily removed and installed using the supplied wrench. 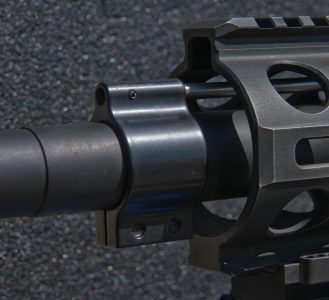 The barrel is 24 inches long, coated, using a 1:10 twist rate and threaded ¾x24 TPI. Silencerco’s Harvester Big Bore .338 Muzzle Brake tops off the muzzle and tames recoil while accepting their Harvester Big Bore Suppressor. DRD Tactical’s custom designed quick detach hand guard uses Magpul’s M-LOK rail and accessory attachments. At 17 inches long it can accommodate most night vision or laser devices with rail space to spare. Locking into place on the upper receiver, it provides a perfectly aligned continuous top rail and machined-in rail for a bi-pod. The DI (direct impingement) gas system includes a gas block, hardened bolt carrier group, and non-reciprocating left side charging handle. Folded forward, the charging handle is out of the way. Hinged, it folds out to run the bolt, automatically snapping forward when going into battery. The Kivaari should be familiar to anyone who has used a standard AR. 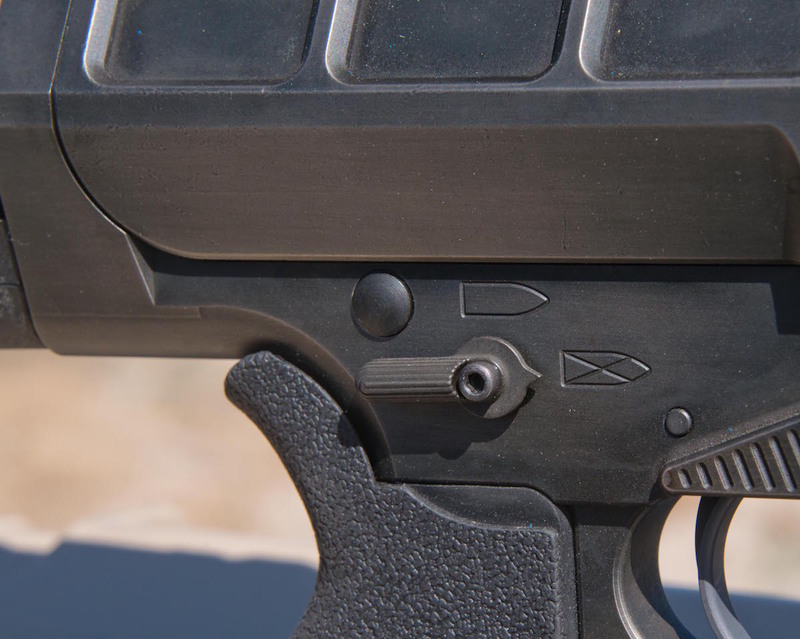 One area where it differs is in its left-side charging handle. The custom-designed lower receiver includes a flared magwell and extended trigger guard, and uses many standard AR parts. The trigger with this rifle was a Wilson Combat TTU that was crisp at about 4 pounds. 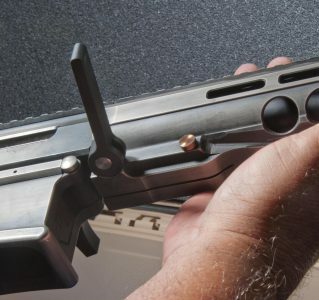 Magazines are purpose built for this rifle, and do not lock the action open. Holding 10 rounds, they are metal, built solidly and capable of tear down for cleaning. Magpul’s PRS stock is attached providing easy adjustment for length of pull and cheek height. An extra recoil pad has been attached. Coated in a Boron Carbide using a battle-worn black and gray pattern, the result of the finish on the rifle is a nice and rugged look. Gray is a great base color, especially for an urban environment (blending well even at night). DRD is a custom shop with superb customer service. Talking to the owner Skip Patel on a Friday, this rifle was shipped out three days later. Skip keeps parts on hand to build these as needed and delivers quickly, unlike others. Orders are processed immediately and built shortly thereafter. Some of the .338 semi autos require payment in full for a rifle that (if you are lucky) arrive six months later. Skip refuses to work that way. The only thing he did not have for the review gun were black magazines, but customers’ guns will match and you will get them quickly. The Kivaari features a low-profile gas block and employs a traditional direct gas impingement system of operation. 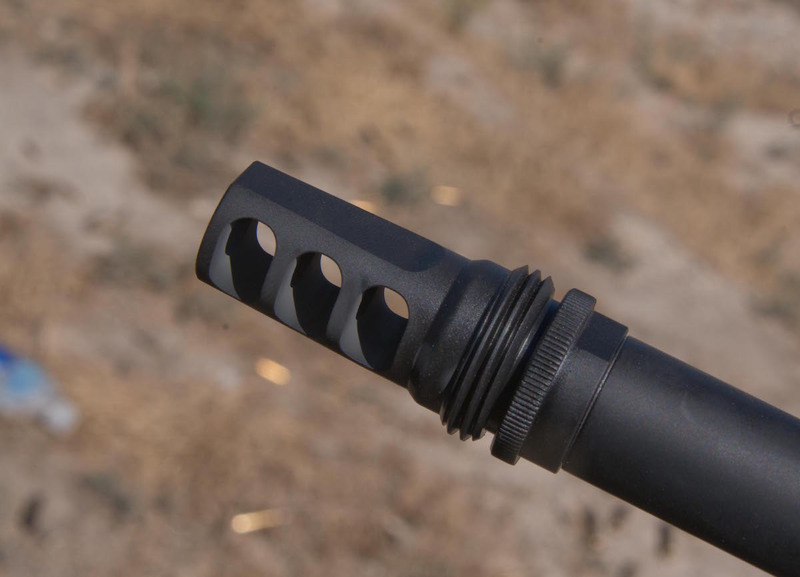 The threaded muzzle is topped off with a SilencerCo Harvester Big Bore .338 muzzle brake. Everything was shipped in a medium-sized hard case using laser-cut hard foam to cradle each part. There is enough room to add your scope and a suppressor if needed. In most cases depending on how you mount the glass it will fit while attached to the receiver. If not, as in the case of the Nightforce used for the testing, it was removed using a QD mount. Two magazines are included along with a wrench for tightening the barrel nut. It is also available with a Tactical Tailor backpack if you intend to take the Kivarri on the move or in the backcountry. The author equipped the Kivaari with a Nightforce ATACR 5-25x56mm F1 first-focal-place scope. One of my favorite Nightforce scopes is their ATACR 5-25 x 56mm F1 (First Focal Plane). When dialing is in order, these scopes are great. Knobs are large and tactile, with white numbers that even my 57-year-old eyes can easily read. My scope uses mils for both wind and elevation and contains a MIL-R lighted reticle. 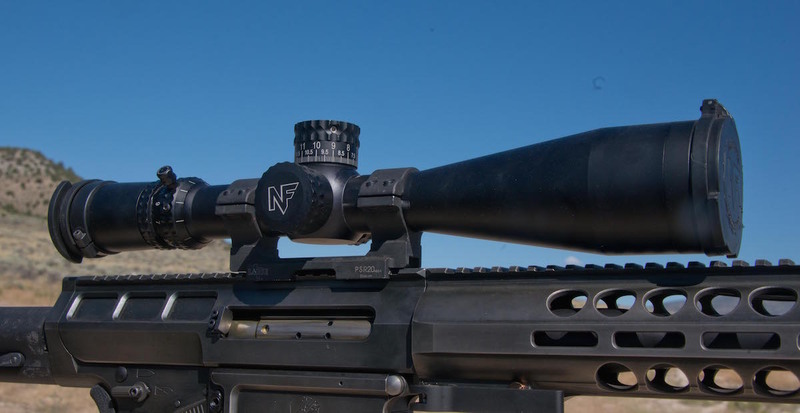 It is about perfect for comps, long range or anything requiring an uncluttered reticle. There is even a small 2 mil box graduated in .10 of a mil for precise measurements. I have used that box effectively for quick ranging using Applied Ballistics 12-inch rule, making this scope incredibly versatile. Mounted it in a Larue Tactical single-piece mount allows me to remove as needed while keeping my zero pretty close. Few if any mounts in my experience will return to an “absolute” zero, and the Larue remains one of the best out there. This mount has seen use over several years and multiple scopes without a single issue. The Kivaari features an AR-style safety that is ambidextrous. 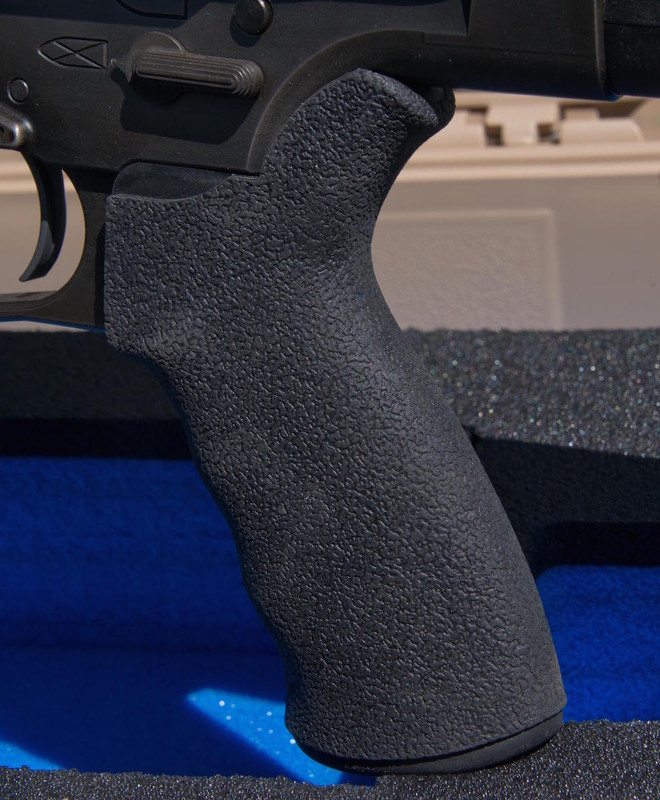 The DRD Tactical .338 can accept standard AR-style pistol grips of the user’s choosing. Recommended ammunition is limited to Lapua, in this case 250-grain Scenars. Talking to Skip, he has experienced a few issues with some of the commercial .338 LM ammunition. It is not just DRD either, as the other manufacturers of .338 LM semi’s expressed the same concern to me. Commercial brass can be softer and more susceptible to case head separation. 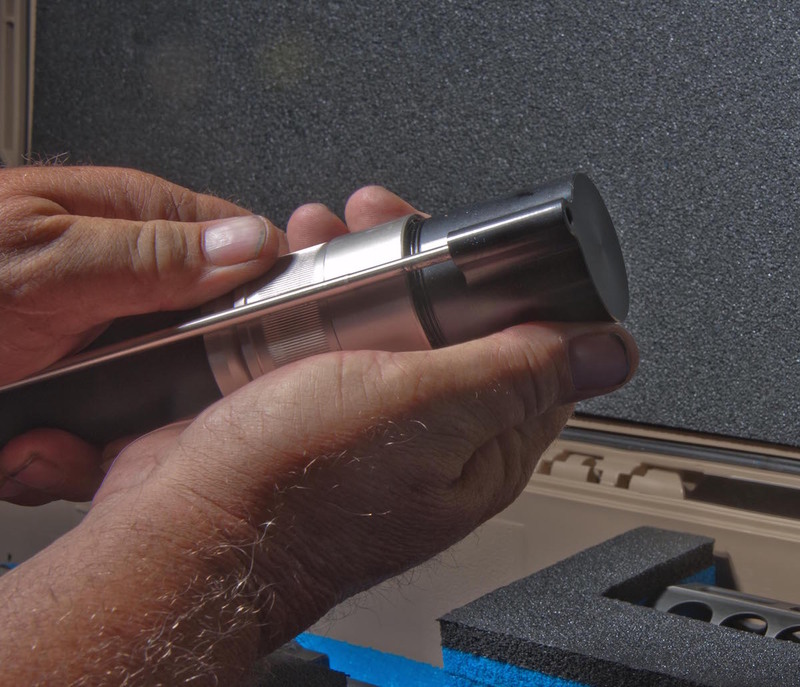 The rear of the case separates from the body leaving it in the chamber. The next round is forced into the casing, causing a malfunction. Apply enough force and a floating firing pin may just ignite the round leading to serious injury. It is common amongst many semi-automatic rifles when soft brass is used. None of the companies making these rifles has an issue when Lapua ammunition is used, so they tend to stick to it. Lapua assisted DRD when they began development so it is well matched to the rifle. 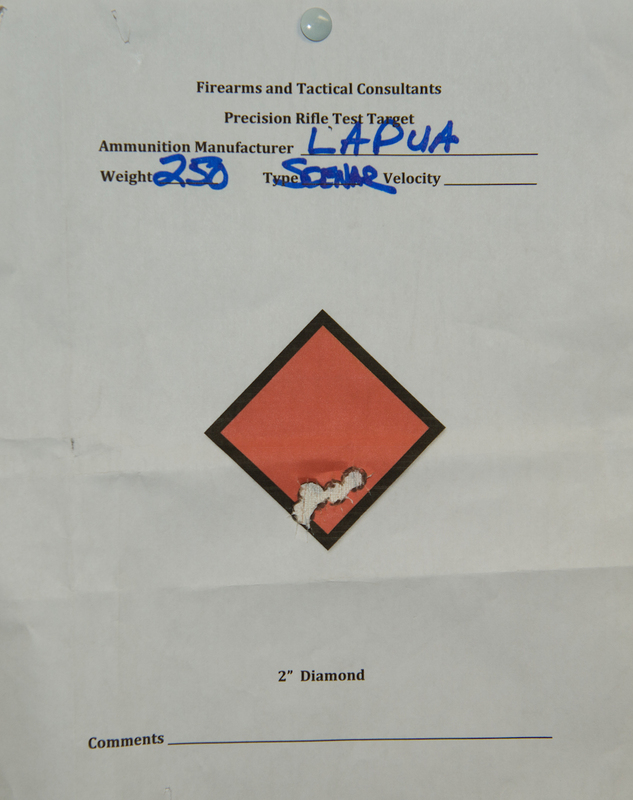 Honoring Skip’s request, only Lapua was used for the test. 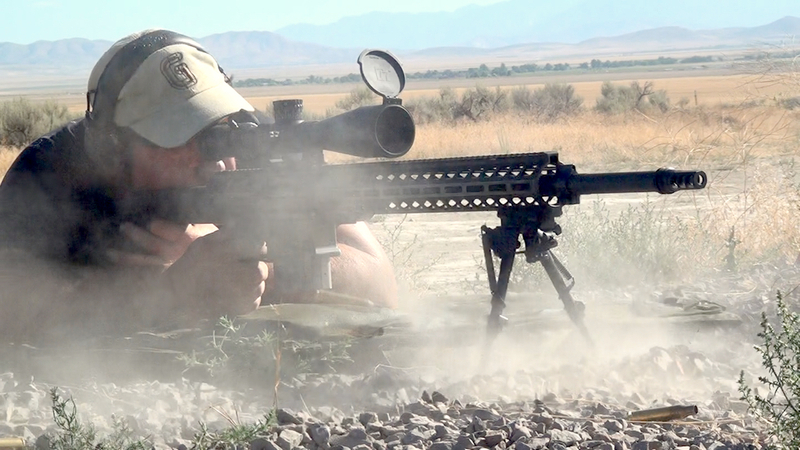 The author started out at 100 yards and got this sub-MOA group before he began pushing out to extended ranges. Accuracy was about as precise as it gets in a semi-automatic in this caliber. With tons of moving parts, it’s not easy keeping things consistent, making tiny groups less likely. Early testing on similar weapons proved marginal. DRD guarantees 1-MOA with Lapua ammunition, and my results were similar. My best group at 100 yards measured .70 inches. Recoil is soft by comparison to most, and the Silencerco Brake seems to keep things steady making for better consistency. Moving to steel at 500 yards three rounds were loaded up, elevation dialed, and it resulted in a cluster dead center of the steel. At only 12 inches the target moves a ton with this round so not sure on the group but it was all dead center on impact. Moving out to 1,000 yards yielded similar results. Once dialed in for wind, hits were center but this caliber still rings steel hard at that range. Even waiting several seconds between shots it was still moving, but the accuracy was pretty impressive. Rapid fire is not something normally equated with this caliber outside military applications. It’s not that you cannot run a .338 LM hard and fast, it’s just not an inexpensive proposition; but the DRD is more than capable of it. 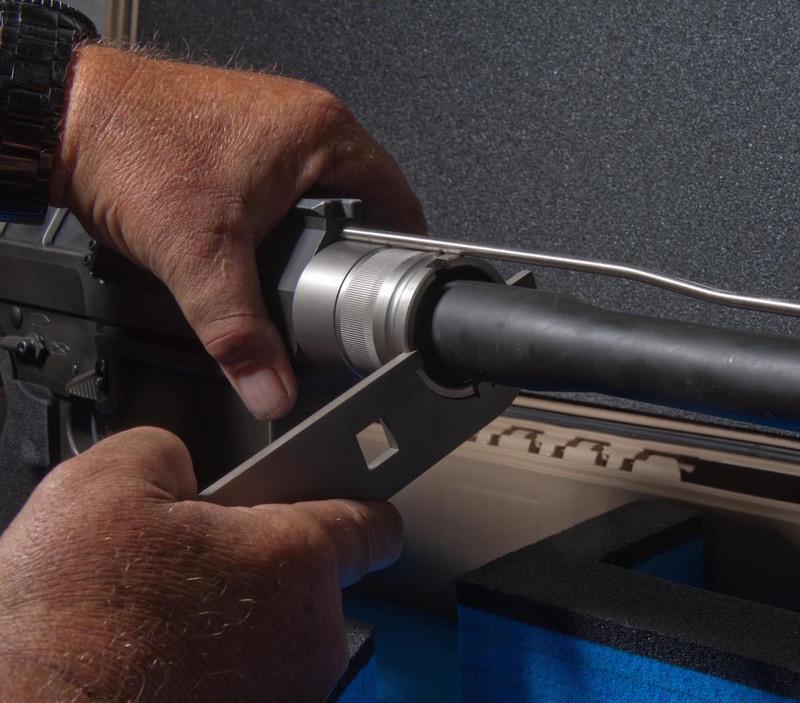 Recoil is minimal and a solid position keeps the rifle on target even as close as 400 yards. Lining up on the steel 8-10 rounds strings were pretty fast, certainly faster than a bolt rifle. Even managed the recoil is going to move the rifle, but not much. Lots of time on a 6.5mm of late meant it took me a bit to get dialed in, but this rifle is a joy to shoot fast. My best eight-round string at 400 yards measured in the sub 6-inch range pressing the trigger as fast as the crosshairs could be lined up. Being able to hold 6 inches at 400 yards rapid fire with a 250-grain bullet making close to 2,900 feet per second is impressive, and would be devastating in the real world. It’s easy to see why SMU want this kind of rifle, given our current theatres of operation it would be very useful. From the bench, the author was able to get some impressive groups at very long ranges. Assembly and take down is simple and quite fast. With practice I could go from case to ready in around a minute. There is a ton of design work in the rifle to make it simple and effective, starting with the precision machined chamber and gas tube protector. While in place it protects the threads on the barrel nut, keeps dirt and debris out of the chamber, and prevents gas tube damage. Insert the barrel, hand tighten the large knurled nut followed by use of the supplied wrench. It does not take much, but with the .338 LM it must be tight. Slide the hand guard over, push the pin and close the lever; done. Attach the scope if it’s not already on the receiver, your bi-pod, sling if necessary and insert a magazine—ready to rock. Take down is as simple and it really facilitates cleaning. Very slick and very well thought out with excellent attention to detail. TAKEDOWN STEP 1: Loosen the barrel nut and remove the gas tube and chamber protector. TAKEDOWN STEP 2: Line up the gas tube and the barrel and then lock into place. TAKEDOWN STEP 3: Tighten the barrel nut by hand first making sure not to cross thread. TAKEDOWN STEP 4: Use the supplied wrench to make certain the nut is tight, but do not overtighen. TAKEDOWN STEP 5: Install then line up the handguard to the receiver using the V-notch. It should sit flush. TAKEDOWN STEP 6: Push the pin in by hand. It should lock in place with thumb pressure. It fit perfectly in the back of my Dodge and should settle into a trunk nicely. Assembled, it fit in my Eagle Industries HSRC drag bag. Adding a suppressor would preclude that, but it does on most .338 Lapua rifles. 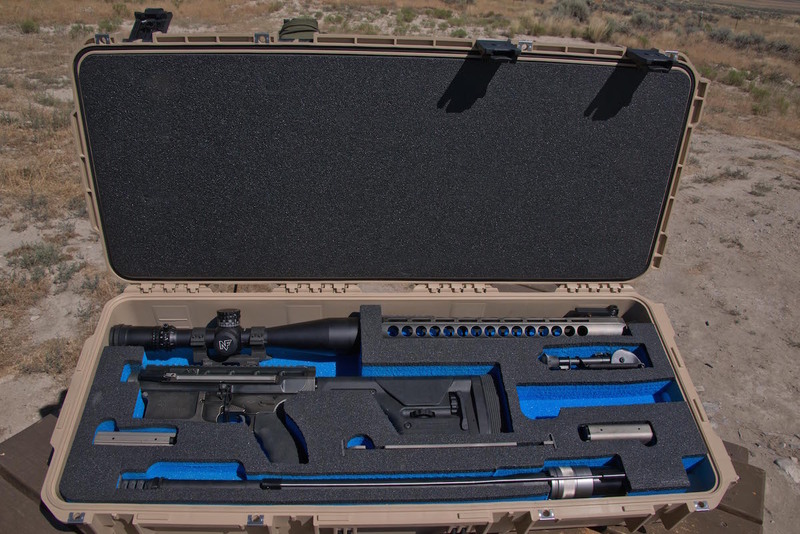 DRD also makes a pack designed specifically for this rifle. My Eberlestock G4 operator carried it pretty easily while assembled. Take it down and it fit with no protrusion either at the top or bottom and was very comfortable. The magazine well of the Kivaari is flared and for quickly feeding in magazines. Note the charging handle. Machining is excellent with fit and finish commensurate with a custom rifle. Magazines are nicely done and function well. Recoil is minimal, accuracy excellent with solid reliability. Semi-automatics in .338 Lapua are becoming more desirable. 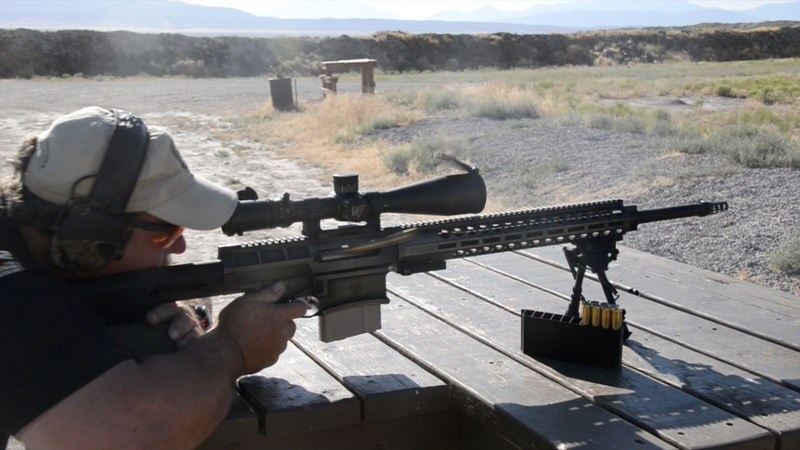 It’s still new in the precision rifle world with a pretty limited market, but it is growing. Many are close to 10K, this DRD retails for $7,200.00 with the battle worn finish ($6,900 for it in black or FDE). Custom bolt rifles in this caliber can cost more, quite a bit in fact making this a good buy. Reload your ammo if you can cause once you start playing with the Kivaari it’s really difficult to stop. If you are in the market for a semi-automatic .338 LM you have a few choices, but the DRD would be one of my first. It is reliable, accurate and quite a bit lighter than some. It is also very simple with many parts being AR-compatible. And, it is a takedown. Triggers, safeties, and the DI system is well proven. If you are in that market be certain the DRD is on the list, it might be exactly what you need. A very impressive rifle, very close to ideal I’ve been looking for since Nemo Arms Omen was introduced in .300WM a few years ago, but I can’t help wondering how on earth DRD has been able to trademark the name “Kivaari” – it (kivääri) literally means “rifle” in finnish. Etymology dates back to the dawn of firearms and it’s a highly established common term describing a shoulder-fired rifled firearm from day to day language all the way to legislation and official translations of EU directives. 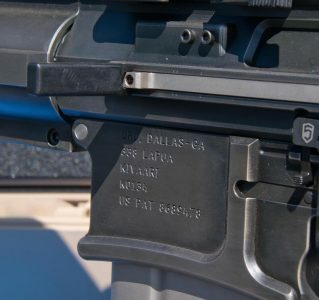 Okay….so I’d absolutely love to have this this gun…love it, love it, love it….However, my pique is that we in America don’t have a clue as to properly pronounce the name of the wonderful cartridge in this particular weapon…yep, nit picking, but when the international crowd hears us pronounce “Lapua”…. they look out of the side of their heads at us!!!! American English loves to pronounce in 3-sylables for some reason…”La—Poo—Aah”—-“Tor-Till-Aaah”…. however, like the Mexican “Tortilla” we need to appear as we know how the world pronounces foreign words correctly. So…in that …I asked the Lapua representative how to exactly pronounce the name of the Company and the Round– to which he smiled widely with grateful surprise…’finally an American wanted to get it right….. “LOP—WAA’. NOT LA-POO-AAH!”. So, be the guy that gets it right when you speak in your group……….”LOP– WAA”. Much ado about nothing…well, not in non-American’s eyes. Hah! F.
Yeah, that there is one fancy critter killer. It cost the same as the new roof I put on my house a couple years back. Why I bet that There fancy shooting iron will kill and gut your rabbit in one shot. Joe; The gun is designed for hunting two legged critters at extreme ranges.